This is the story of the Indianapolis Motor Speedway's busiest year for events - 1910. Carl Fisher and his partners A.C. Newby, James Allison and Frank Wheeler staged three major auto racing events at each of the summer holiday weekends - Memorial Day, July 4th, and Labor Day. These contests served up great names of the era: Johnny Aitken, Barney Oldfield, Ray Harroun, Joe Dawson and Ralph De Palma. But perhaps the most amazing event was their June aviation show featuring entries by Wilbur and Orville Wright and their star pilot, 21 year-old Walter Brookins. The season was capped off with a gas balloon race featuring the Indiana entry of Carl Fisher. 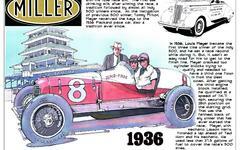 The year was a pivot point for the great Speedway which birthed the legendary Indianapolis 500 in the following year.